Even though I regularly blog about sharing books with my first grader, I actually have a very hard time remembering what books I enjoyed reading when I was in elementary school. I have fond memories of the early picture books I loved when I was really young (like The Monster at the End of The Book) and I still have copies of the books that got me through middle school (most memorably, The Hitchhiker’s Guide to the Galaxy), but I can barely recall what, if anything, I was reading between first and fifth grades. However, the one exception to that memory blackout involves Choose Your Own Adventure books. I ADORED Choose Your Own Adventure books. I read them non-stop, almost obsessively, and, when I picture my childhood bookshelf in my mind, I can see whole rows of those thin white paperbacks with the numbers and red bubbles on the side. So, when I recently stumbled onto the “Choose Your Own Adventure” shelf in the kid’s section of our local library, I’ll admit – I totally forced my daughter to bring a few home. She wasn’t entirely sold on the concept, but she could see how excited I was and quickly agreed to try some, if only to shut me up. And, I’m pleased to report, it resulted in some of the most entertaining read-aloud time we’ve had in MONTHS. They were a huge, huge hit. You can find a list of the entire Choose Your Own Adventure back catalog here. The titles we checked out came from the 2005 re-release of the series, which took some of original titles from the 1970s and 80s editions, and revamped them with updated text, pictures, and titles. 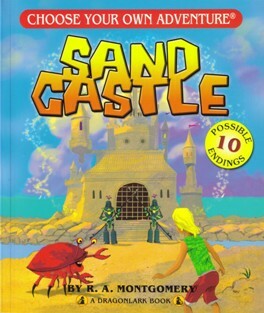 We started with the first book in the re-released series, The Abominable Snowman by R. A. Montgomery, and a CYOA picture book (which was new to me) titled Sand Castle, also by R. A. Montgomery. If you’ve never read a Choose Your Own Adventure book before, they’re a little hard to explain. They’re not like much else in the kid lit market. They sort of resemble chapter books, in terms of length and reading level, but, structurally, they’re something completely different. 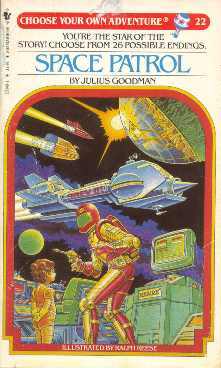 CYOA titles are sometimes referred to as “game books”, which is semi-accurate, if only because the word “game” suggests something interactive. The structure of a Choose Your Own Adventure book is designed to make the reading experience immersive. They’re written from the rarely-used second-person point-of-view – so the narrator is always referring to the reader as “You.” When a kid opens a CYOA book, they’re told something like, “You are a deep sea explorer searching for the famed lost city of Atlantis” or “You are born on a spaceship traveling between galaxies on a dangerous research mission.” It sets the stage for the adventure to come and it prompts the young reader to actively use their imagination while they listen. The lead character is never described in detail because “You” are that character. After a two-page set-up, the reader is quickly presented with various choices that will dictate where the story can go – i.e. where the “choosing” of one’s own adventure begins. Are you going to stay at your base-camp in the Himalayas or are you going to go looking for your missing friend? Will you fight the giant squid or swim away? Will you join the space circus or carry on with your rocket-ship caravan across the stars? (Those are all real scenarios.) If you chose option A, turn to page 51. If choose pick option B, turn to page 52. And each choice leads to more choices and more choices and, eventually, an ending. And, if you don’t like your ending, you’re encouraged to re-read the book, make different choices, and follow a different path to a different ending. I know some people regard Choose Your Own Adventure books as gimmicky, but I disagree. Yes, they don’t have the depth of emotion or character that a Newbery Medal-winning chapter book has, but I think they represent a very unique flavor of children’s lit that is becoming more and more relevant in the modern era. Because Choose Your Own Adventure books are fantastic tools for introducing kids to “branching narratives,” a form of storytelling that is flourishing lately thanks to video games and new technology. In such wildly influential video games like Mass Effect and BioShock, kids are being exposed to new kinds of interactive storytelling – stories that have structures that are very different from the static reading experiences they’re normally used to. And, by “static”, I’m not suggesting that normal print books are staid or boring. I’m just stating that the plots in most YA novels can’t be influenced by pushing up, up, down, down, left, left, right, right, B, A, Start. Alternately, in many recent video games, players follow very fleshed-out, very detailed storylines – often written by novelists or screenwriters with legit credentials – and they can then watch those narratives alter or evolve based on the choices they’re making in the game. Video games are often built with multiple plotlines and endings, just so that the player can feel like they really have a hand in directing where the storyline goes. In Mass Effect, for example, the choices you make as your character can influence and customize the events you experience in every game in the series. It is a very modern, very immersive form of storytelling – the branching narrative – and the Choose Your Own Adventure series has been introducing kids to the most basic form of the branching narrative since 1979. And I think that’s incredibly cool. 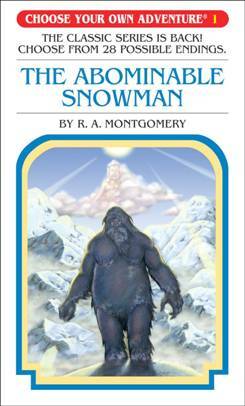 A few pages into The Abominable Snowman, my daughter’s initial skepticism was totally gone. After three pages, she understood the concept completely and was fretting over which path she should take on each page. (Her most often-asked question was, “Which way do you think leads to more adventure?”) While my daughter was disappointed that she was never eaten by a Yeti – we tried so many times to find that darkest of timelines – she did get a kick out of some of the more “And then you died” resolutions in the later volumes like Journey Under the Sea and Space and Beyond. Across all the books, the plotlines (or “branches”) resolve themselves pretty quickly – each branch from beginning to end is maybe eight to ten pages long – which makes it easy to either a). read one quickly or b). go back and run through several scenarios while your kid’s interest is still piqued. 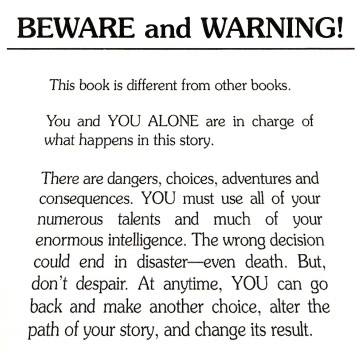 So, if you haven’t already, I’d definitely recommend trying out a Choose Your Own Adventure book with your kids at some point, if only because the CYOA titles offer a really unique reading experience that you simply don’t get from most children’s books. It’s not better or worse, but it is gloriously DIFFERENT. Are the stories brilliant? Is the writing award-worthy? No. If less-than-literary prose gives you a headache, you might want to steer away from the series. BUT there is a definite pulp-fiction quality to the CYOA text that, if it clicks for you, can be just as endearing as watching your favorite Saturday afternoon B-movie. The CYOA books might not turn your kid into the next Jonathan Franzen, but they will grab your kid’s attention and potentially inspire a few weeks worth of brilliant imaginative play scenarios. What I love about Choose Your Own Adventure books is how they give young readers a sense of power and ownership over the narrative and how it reminds them that reading a story can be a very dynamic experience. If you have a gamer kid at home or if you just think your kid would get a kick out of a role-playing scenario where they’re cast in the role of a monster-hunter or a space captain, chose a CYOA book the next time you’re at the library, turn to page 60, and enjoy. If you ignore my advice and read something else, turn to page 61. AGE RANGE: You can find a breakdown of reading levels for CYOA books here – check out the gray sidebar on the left side of the page. Obviously, the picture books skew younger, but I had no problem, in terms of appropriateness, reading the regular titles to a six-year-old. Even though you sometimes come to a sticky end in some of the plotlines, the scenarios are very kid-friendly and free of gory or salacious details. PAGE COUNT: The usual, chapter book-esque titles are normally around 115-130 pages, but, in that page range, you can experience up to 42 different endings, which, again, is very cool. CYOA WEB SITE: You can find the official website of the current CYOA publisher here or you can check out the Wikipedia page for a broader look at the publishing history of the series. BUY IT, BORROW IT, OR FORGET IT? : I would borrow a few from the library first, just to make sure your kid enjoys the format and doesn’t get bored with the structure too soon. I CAN NOT FIND A SINGLE CHOOSE YOUR OWN ADVENTURE BOOK ONLINE! Check out the Ultimate Ending series of books, bigger and better than the original CYOA’s and available in both paperback and electronic/kindle formats. I am Anthony Lampe, creator and author of Explore-A-Quest, a new and exciting interactive book series with multiple paths and endings. If you like the Choose your Own Adventure books, check out the Explore-A-Quest series. I loved these too! And I was super sad when my husband texted me a picture of a bunch of these books after he’d already taken them from his mom’s house to the thrift store. Super, super sad. It KILLS me that I can’t find a single Choose Your Own Adventure book from my youth. I had SO many of them and I just don’t know what happened to them.